Blogging for achieves two things for me as an artist. First, it offers a platform to promote artists that I believe to be the most talented, but may not get the respect and credit I believe they deserve. Second, blogging provides an opportunity to give context to the artwork and promotions that I do here at ra-nyc.com. Soundbombing Vol II is a classic hip hop album that has definitely inspired me for years and is the basis of the RA project called BRTH A N8TN. 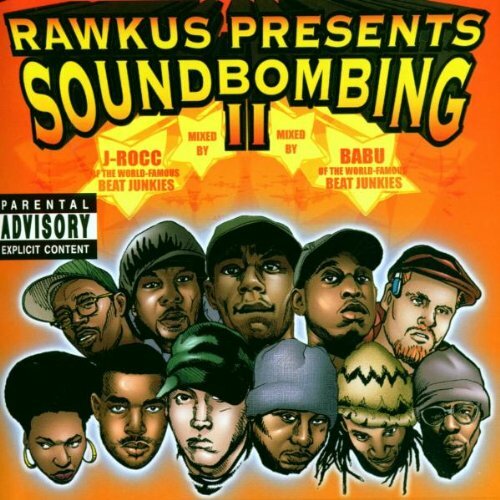 Soundbombing Vol II was my introduction to artists like R.A. The Rugged Man, Company Flow, Eminem and gave me more exposure to backpacker lyricists like Mos Def, Talib Kweli, Common, Pharoahe Monch, J-Live and other mc's like Cocoa Brovaz, Skillz, etc. Projects like Soundbombing Vol II put a ridiculous list of talented lyricists, dj's and producers on one project that instantly made an impact on hip hop culture. Soundbombing Vol II combines so many elements of hip hop that it's hard to believe that isn't widely held as a relavent model for hip hop albums. I still regularly listen to Any Man (by Eminem) and Stanley Kubrick (by R.A. The Rugged Man) and the whole album is always on my IPhone. features: Eminem, High & Mighty, Mos Def, Skillz, Shabaam Sahdeeq, Pharoahe Monch, R.A. The Rugged Man, J-Live, Prince Paul, Kid Capri, Medina Green, Pete Rock, Marley Marl, Sir Menelik, Sadat X, Grand Puba, Talib Kweli, Hi-Tek, Tash, Dilated Peoples, Thirstin Howl III, Company Flow, Q-Tip, Common, Diamond D and the Cocoa Brovaz.